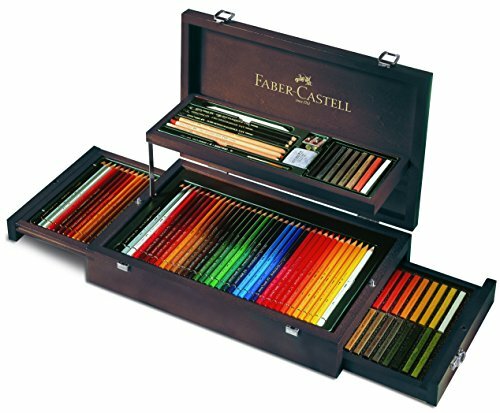 WHAT IS IN THE WOODEN CASE: 36 Albrecht Durer watercolour pencils 36 Polychromos pencils 36 Polychromos artists' pastels Selective Pitt products WHAT IS IT:Faber-Castell Art and Graphic Collection Mahogany Vaneer Case These pencils provide artists with great versatility of expression when drawing, shading and painting in watercolors. The wooden case has been designed for painting and drawing. These easy to use watercolor pencils can also be used by untrained artists as well as professional. Fine lines and details are not a challenge any more when using these art tools. The paint becomes permanent when dry, enabling other layers of color to be superimposed without causing it to dissolve again. The Case Excellent quality wooden case. It is easy to store or to transport. You can take it anywhere and get inspired wherever you may be. The perfect gift for a true art lover! These pencils provide artists with great versatility of expression when drawing, shading and painting in watercolors. The wooden case has been designed for painting and drawing. These easy to use watercolor pencils can also be used by untrained artists as well as professional. Fine lines and details are not a challenge any more when using these art tools. The paint becomes permanent when dry, enabling other layers of color to be superimposed without causing it to dissolve again.